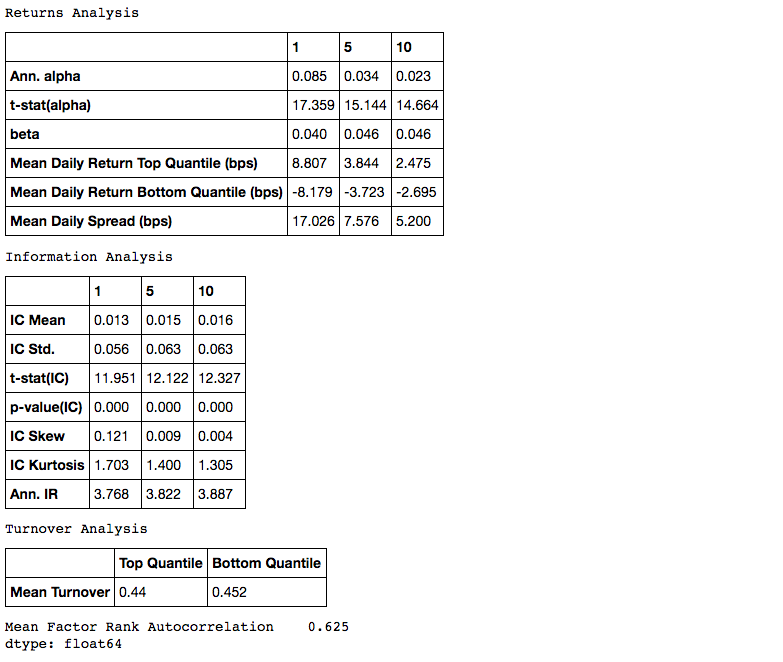 Alphalens is a Python Library for performance analysis of predictive (alpha) stock factors. Alphalens works great with the Zipline open source backtesting library, and Pyfolio which provides performance and risk analysis of financial portfolios. Check out the example notebooks for more on how to read and use the factor tear sheet. A good way to get started is to run the examples in a Jupyter notebook. From the notebook list page(usually found at http://localhost:8888/), navigate over to the examples directory, and open any file with a .ipynb extension. Execute the code in a notebook cell by clicking on it and hitting Shift+Enter. If you find a bug, feel free to open an issue on our github tracker. If you want to contribute, a great place to start would be the help-wanted issues. For a full list of contributors see the contributors page. Information on a specific functions, classes, or methods. © Copyright 2016, Quantopian, Inc..